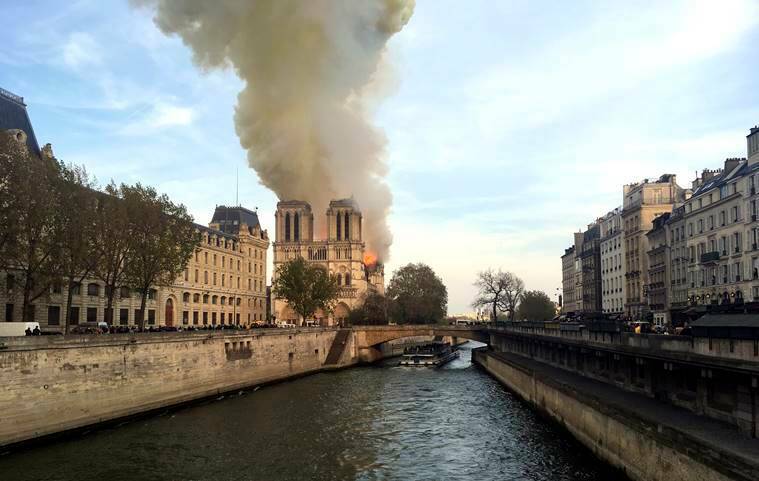 Paris Notre Dame cathedral fire LIVE Updates: French President Emmanuel Macron said France would launch a campaign to rebuild the cathedral. A massive fire that engulfed Notre-Dame Cathedral in Paris on Monday is completely under control. It is partially extinguished and there are residual fires to put out, French firefighters spokesman said. The fire gutted the roof and the spire of the medieval structure. The firefighters managed to save the shell of the stone structure and its two main bell towers from collapse. Huge clouds of yellow smoke could be seen billowing over the eight centuries-old cathedral as the fire raged throughout the evening. The cause of the incident, which was being treated as an accident by the police, was not clear. The 12th-century cathedral was undergoing renovations, with some sections under scaffolding. 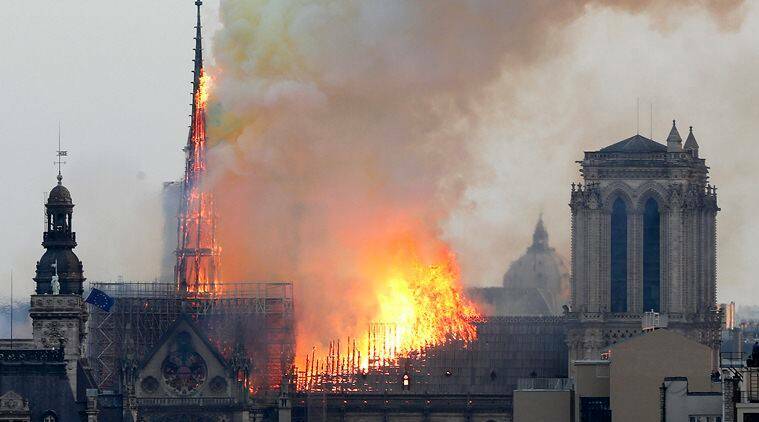 “A terrible fire is underway at Notre-Dame Cathedral in Paris,” Mayor Anne Hidalgo said on Twitter. Expressing pain, French President Emmanuel Macron tweeted, “Our Lady of Paris in flames. The emotion of a whole nation. Thought for all Catholics and for all French. Like all our countrymen, I’m sad tonight to see this part of us burn”. The President has also postponed his televised speech to the nation following the blaze incident. The fire, which began in the early evening, sent flames and huge clouds of grey smoke billowing into the Paris sky. "Horrified by the pictures coming from Paris with the fire engulfing Notre-Dame Cathedral - a unique example of world heritage that has stood tall since the 14th century. My thoughts are with the people and government of France," Secretary-General Guterres said in a tweet as images began to flash on television and social media of a burning Notre- Dame Cathedral. French President Emmanuel Macron told reporters near the scene that he will seek international help, including from the ``greatest talents'' in the world, to rebuild Notre Dame. A picture taken of the Notre Dame Cathedral in Paris showing a man playing with his daughter went viral on Twitter. "I took this photo as we were leaving Notre Dame about an hour before it caught on fire. I almost went up to the dad and asked if he wanted it. Now I wish I had. Twitter if you have any magic, help him find this," a Twitter user wrote. 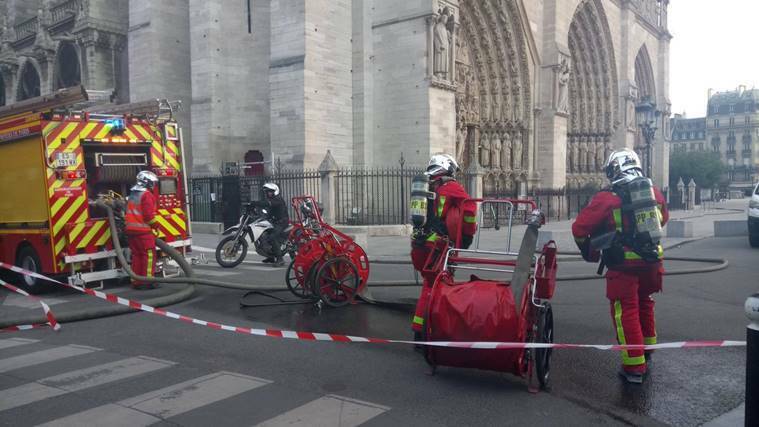 French Firefighters spokesman has said the Notre-Dame Cathedral fire is under control, partially extinguished. The fire that devastated Notre-Dame Cathedral in Paris on Monday prompted fund-raising appeals in the United States, as people horrified by the blaze began making commitments to restore a global landmark even before the flames were extinguished, Reuters reported. Notre Dame Cathedral fire: What was lost in the blaze? 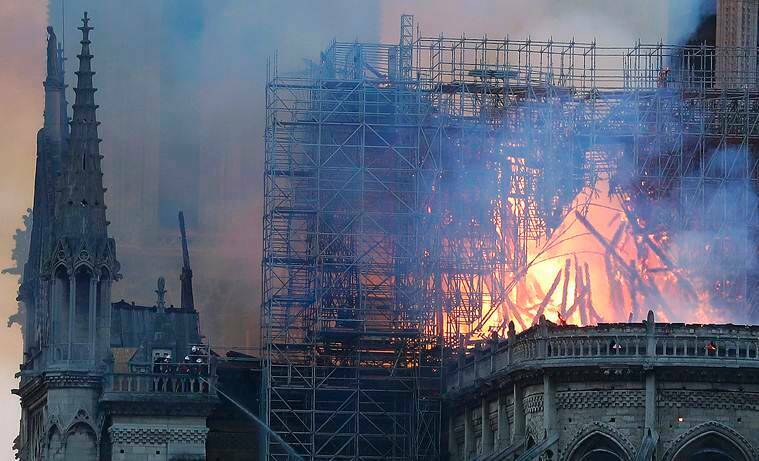 A colossal fire brought down the church spire and the roof of the Notre Dame Cathedral Monday. A centuries-old crown of thorns made from reeds and gold and the tunic worn by Saint Louis, a 13th-century king of France, were saved, Notre-Dame's top administrative cleric, Monsignor Patrick Chauvet said. But firefighters had struggled to take down some of the large paintings in time, he said. The main structure of Notre Dame cathedral in central Paris has been saved after hours of fire-fighting to put out a devastating blaze. 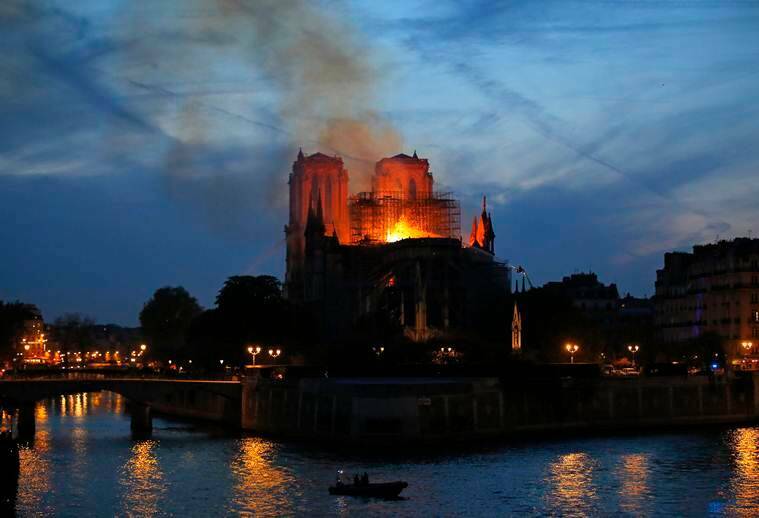 "We can consider that the main structure of Notre-Dame has been saved and preserved," Paris fire brigade chief Jean-Claude Gallet told reporters outside the cathedral. He also added that it appeared that the two main towers of the building had now been saved. * Fire spreads to the giant spire. * French President Emmanuel Macron cancels planned TV address to the nation to go to the scene. * Île de la Cité, the island on which Notre Dame sits, is evacuated by police. 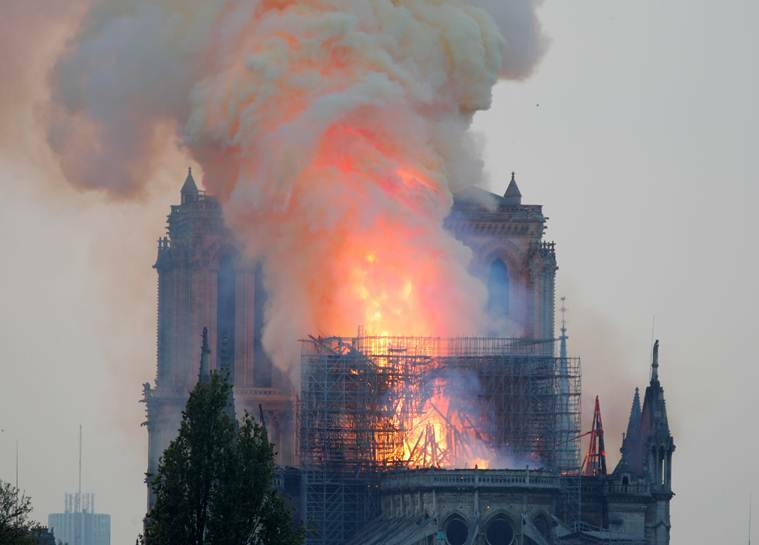 As the colossal fire continues to engulf Notre Dame Cathedral, the Fire Chief Jean-Claude Gallet said it’s unclear if city firefighters will be able to keep the blaze from spreading and causing more destruction. 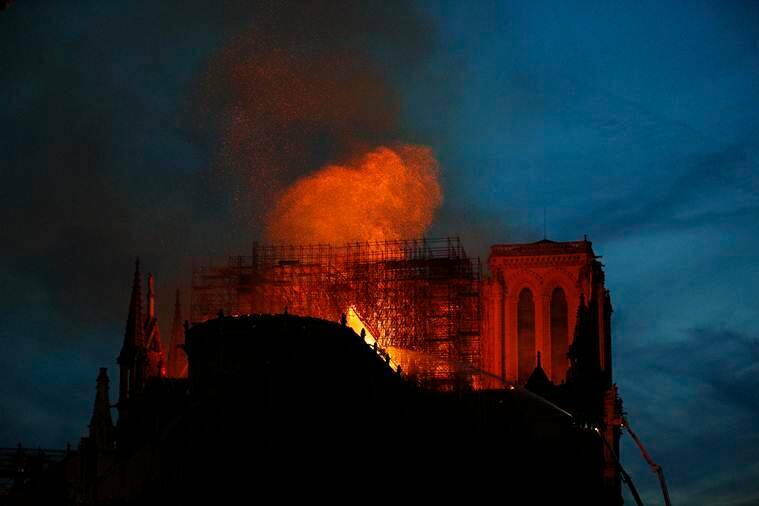 “We are not sure we are capable of stopping the spreading” to Notre Dame’s second tower and belfry, AP quoted him as saying. 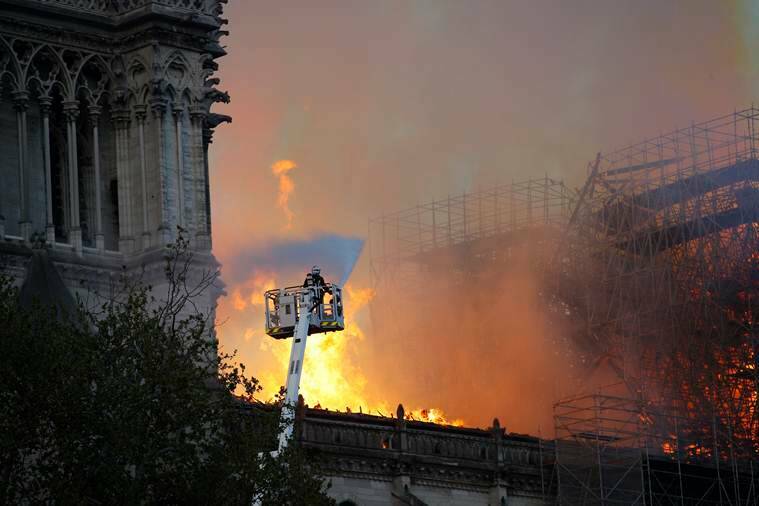 Speaking outside the iconic cathedral, Gallet said, “If it collapses, you can imagine how important the damage will be.” Flames already have reached one of Notre Dame’s towers and brought down the church spire that extended 96-meters-high (315-feet). As the fire continued to rage at the Notre Dame Cathedral, France’s Interior Ministry said firefighters might not be able to save the structure. The blaze collapsed the cathedral’s spire and spread to one of its landmark rectangular towers. A spokesman said the entire wooden frame of the cathedral would likely come down, and that the vault of the edifice could be threatened too. The Vatican issued a statement about fire that gutted Notre Dame Cathedral in Paris. 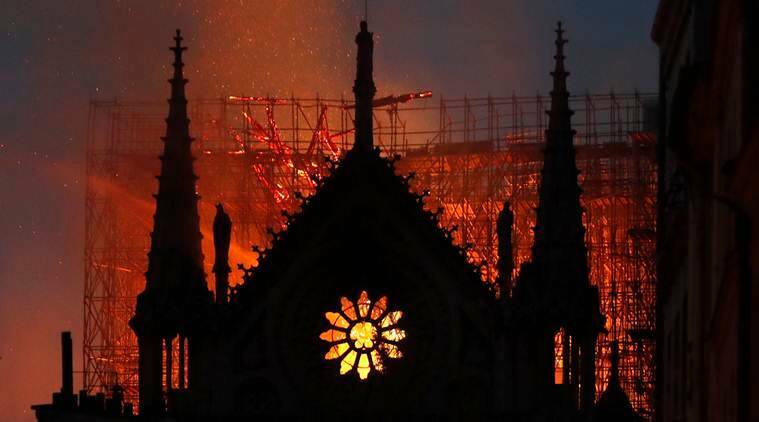 “The Holy See has seen with shock and sadness the news of the terrible fire that has devastated the Cathedral of Notre Dame, symbol of Christianity in France and in the world,” it said. The statement further said the Vatican is praying for firefighters “and those who are doing everything possible to confront this dramatic situation” on Monday. French President Emmanuel Macron reached the spot of the tragedy Monday evening and held meetings at the nearby Paris police headquarters. He is treating the fire engulfing Notre Dame Cathedral as a national emergency. “All means” except for water-dropping aircraft have been deployed to tackle the blaze, France’s civil security agency said. 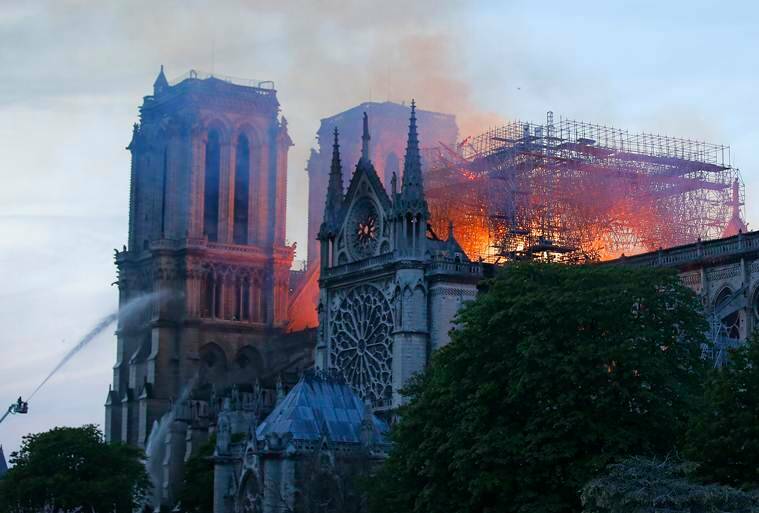 The defense agency said those were unsuitable for fires like the one at Notre Dame because dumping water on the building could cause the whole structure to collapse. Parisians and tourists watched in sheer horror as colossal fire swept through the iconic Notre Dame Cathedral. Some were in tears, others offered prayers from the banks of the river Seine as structure was consumed by the inferno. "This is really sad - the saddest thing I've ever stood and watched in my life," a British tourist said. People gasped in stunned disbelief and horror as the church's spire came crashing down. The mammoth fire that destroyed the spire of Notre Dame Cathedral has spread to one of the church’s landmark rectangular towers. Paris police say fighters are inside the cathedral working to put the flames out while others work from the exterior. Red smoke is pouring out of the cathedral. A Notre Dame spokesman said earlier that the church’s entire wooden interior was in flames. 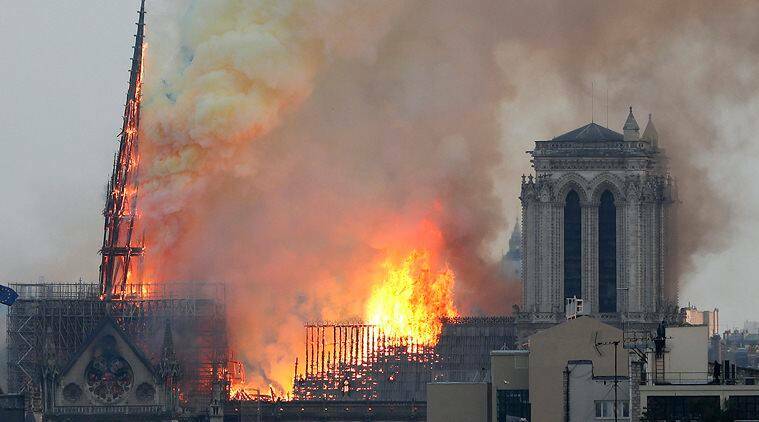 Notre Dame Cathedral in Paris was devastated in the massive fire which engulfed the Parisian landmark Monday. It is a major loss for the city as the monument has come to form part of Paris' identity in the world. The foundation stone of this medieval cathedral, known as Notre-Dame de Paris ("Our Lady of Paris"), was laid in 1163 in the reign of Louis VII and was constructed over the next century. The stonework and stained glass of the edifice recreate images and lessons from the Bible. Major restoration and additions were made in the 17th and 18th century to the Gothic structure. London Mayor Sadiq Khan expressed his sorrow at the incident and extended solidarity. 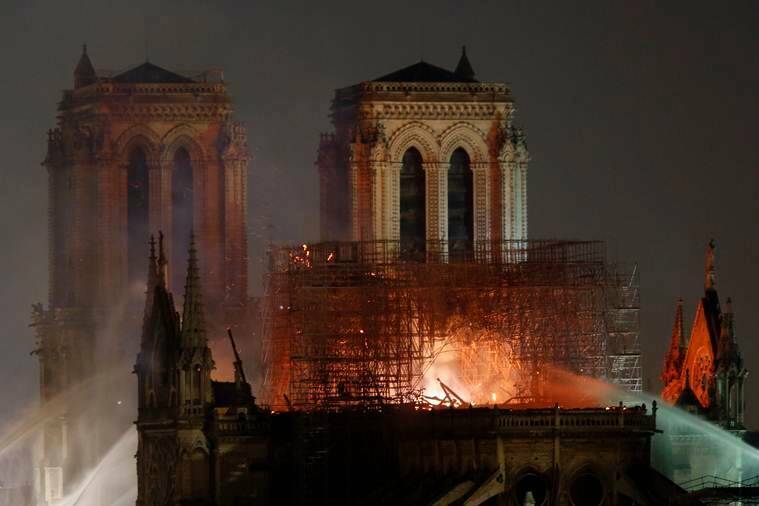 A spectator, watching the fire from a fifth-floor balcony two blocks from the southern facade of the cathedral, was quoted as saying, "Basically the whole rooftop is gone. I see no hope for the building." Meanwhile, a police officer present at the site of the site said, "Everything is collapsing." Saddened by the damage caused by the fire at the historic Parisian landmark, French President Emmanuel Macron expressed the "emotion of a whole nation" on seeing the famed Notre-Dame cathedral ablaze and its spire collapse. "Notre-Dame consumed by flames. 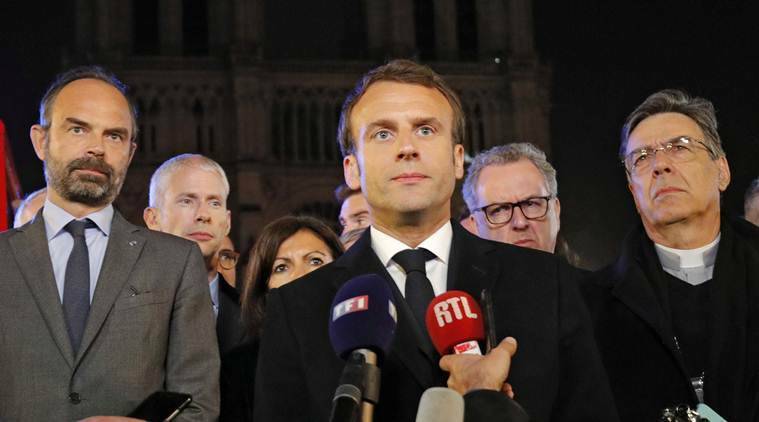 Emotion of a whole nation," Macron tweeted, adding that "like all my compatriots I am sad to see a part of us burn this evening" and expressing solidarity with "all Catholics and all French people." US President Donald Trump tweets, "So horrible to watch the massive fire at Notre Dame Cathedral in Paris. Perhaps flying water tankers could be used to put it out. Must act quickly!" The authorities said the fire at the Notre Dame Cathedral in Paris could be linked to the ongoing renovation work at the monument. It's unclear if anyone has been hurt in the fire. President Emmanuel Macron cancelled an address to the nation that he had been due to give later on Monday evening. A presidential official said Macron was to go to the scene of the blaze. Macron's pre-recorded speech was set to be aired later Monday on French TV. Macron was expected to lay out his plan to address the citizen complaints that gave rise to the yellow vest protests that have rocked France since November. Expressing pain, French President Emmanuel Macron tweeted, "Our Lady of Paris in flames. Emotion of a whole nation. Thought for all Catholics and for all French. Like all our countrymen, I'm sad tonight to see this part of us burn". The President has also postponed his televised speech to the nation following the blaze incident. Notre-Dame Cathedral went up in flames on Monday in a roaring blaze that devasted the Parisian landmark, one of France's most visited places. Flames burst through the roof of the centuries-old cathedral and quickly engulfed the spire, which collapsed. Notre-Dame was in the midst of renovations, with some sections under scaffolding and bronze statues were removed last week for works. The wood and lead spire was built during a restoration in the mid-19th century, according to the cathedral's website. 3 What is the status of investigations related to Donald Trump?